This is a one-day overview of all Lean principles with a fun and interactive simulation to demonstrate the application of the Lean tools. 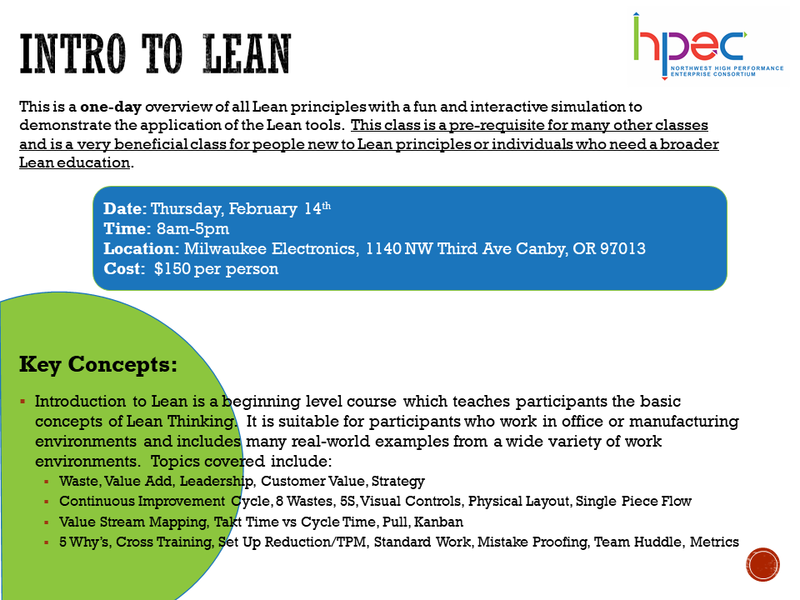 This class is a pre-requisite for many other classes and is a very beneficial class for people new to Lean principles or individuals who need a broader Lean education. Introduction to Lean is a beginning level course which teaches students the basic concepts of Lean Thinking. This includes topics around waste, value, 5S, single piece flow, Kanban, etc. It is suitable for students who work in office or shop environments and includes many real-world examples from a wide variety of work environments. See the image below complete details and concepts that are covered. Contact jennifer@nwhpec.com to register or to discuss hosting this class at your organization.